Mismatch between domain name of you had attached to the site and inputed CNAME of DNS server. For example, in the following figures, domain is registered example.com for Shifter, but www.example.com is assigned for Shifter's site on DNS. When visitors access www.example.com, they'll get ERR_SSL_VERSION_OR_CIPHER_MISMATCH error. Remove current domain from Shifter then assign your domain name (e.g. www.example.com) to it. Check out and follow Step 2: Add Domain of Assigning a custom domain name on Shifter. If you want to use/assign both of example.com and www.example.com to Shifter, never forget input example.com to Domain Name and www.example.com to Alternative Names. After that click [Submit] and verify your domain, then attach it. 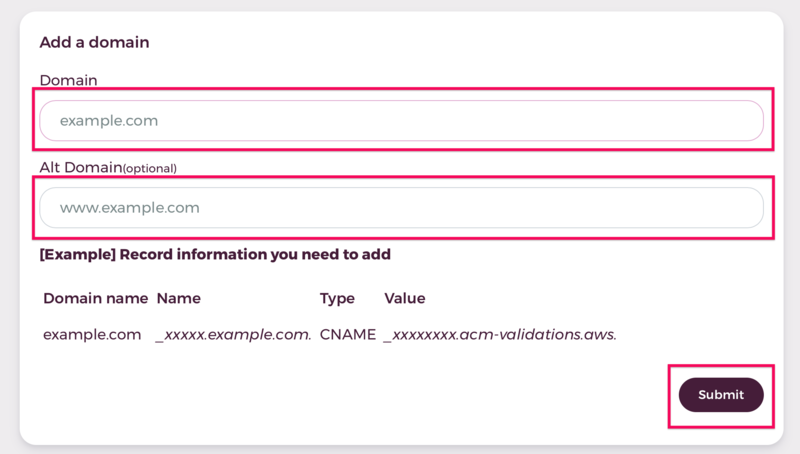 You'll get assigned domains, like below figure. These settings enables you and visitors to access https://example.com/ and https://www.example.com/.